Q: The Taiwan side claimed that the mainland used vast financial incentives to lure the Dominican Republic to sever "diplomatic ties" with Taiwan. What is your comment? A: There is only one China in the world. The Government of the People's Republic of China is the only legal government representing the whole of China, and Taiwan is an inalienable part of China's territory. It is completely in line with international law and norms guiding international relations for the Dominican Republic to sever the so-called "diplomatic ties" with the Taiwan region and establish diplomatic relations with the People's Republic of China. It also serves the fundamental and long-term interests of the people in the two countries. Everything involved is logical, rightful and aboveboard. There is no lure or deal to speak of. 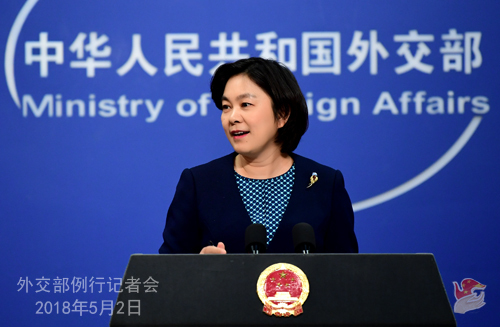 China's establishment of diplomatic ties with the Dominican Republic is conditioned on only one premise, which is the recognition and adherence to the one-China principle, a position that has been declared by the Dominican side in the Joint Communiqué on the Establishment of Diplomatic Relations between the People's Republic of China and the Dominican Republic and their public statements. So the time and conditions are all there for it to happen. We believe that the establishment of diplomatic ties between China and the Dominican Republic will open up broad prospects for the all-around friendly cooperation between the two countries. This is another testament to the fact that adherence to the one-China principle is the universal consensus of the international community. It corresponds with the aspiration of the people and the trend of the times. Q: According to reports, State Councilor and Foreign Minister Wang Yi visited the DPRK today. What is the purpose and agenda of this visit? China has been stressing that it will play a positive role in dealing with the Korean Peninsula issue, so what does that mean specifically? A: State Councilor and Foreign Minister Wang Yi's visit to the DPRK is an important measure for the two sides to follow through on the consensus of the two state leaders and strengthen high-level exchange and strategic communication. The two sides will exchange in-depth views on China-DPRK relations, the situation on the Peninsula, etc. We will release the information on this visit in due course. 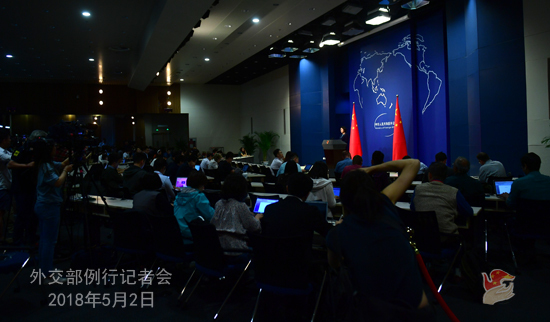 As for what role China is going to play regarding the Peninsula issue, China has always stayed committed to realizing the denuclearization of the Peninsula, upholding its peace and stability and finding a solution that accommodates the legitimate security concern of various parties through dialogue and negotiation. 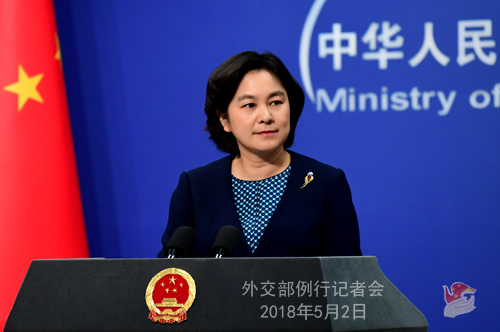 In response to the crux of the Peninsula issue, China put forward the "suspension-for-suspension"proposal and the dual-track approach, namely, advancing the denuclearization and establishing the peace regime of the Korean Peninsula in a synchronized manner, with a view to realizing the lasting peace and stability of the Peninsula and this region. We are pleased to see that the situation on the Peninsula is moving forward in the right direction. We hope to work with various parties to consolidate and carry on the positive momentum on the Peninsula and continue to make positive efforts and play a constructive role for the final settlement of the Peninsula issue. Q: Starting tomorrow, a large delegation of senior US trade officials will be coming here for trade talks, which will be led by Vice Premier Liu He from the Chinese side. I am aware that the Foreign Ministry is not in charge of these talks, but I am still hoping that you can give us some idea of what the Chinese government's expectations for the talks and whether or not you think there will be any breakthrough considering the current China-US trade dispute? A: As you just said, trade-related issues are within the remit of the Commerce Ministry. Since you asked this question, I can confirm that China welcomes the upcoming visit by a US delegation led by Treasury Secretary Steven Mnuchin, who is also US President's special envoy, scheduled from May 3 to 4. Chinese Vice Premier Liu He, also a member of the Political Bureau of the Communist Party of China Central Committee, will exchange views on China-US economic and trade issues of common concern with the US delegation. You asked about our expectations and whether the talks will produce any breakthroughs. We have been reiterating our views on China-US economic and trade relations multiple times. As the world's top two economies, the US and China should properly resolve relevant disputes through equal-footed consultation and maintain the long-term stability of China-US economic and trade ties. It undoubtedly serves the common interests of the two countries as well as the world economic stability and growth. In light of the economic volumes of the two countries and the complexity of bilateral ties, it is never very practical to imagine all problems being wiped out through one-time consultation. However, as long as the US is sincere about maintaining the long-term stability of China-US economic and trade ties and comes to the negotiating table with mutual respect, equal-footed consultation and win-win results in mind, then we believe that the bilateral consultation would be constructive. Q: Given the latest progress made at the inter-Korean summit on Friday, does China think that the time is getting close that the UN sanctions should be eased? Does China think it is the time for the United States to drop its unilateral sanctions against the DPRK? A: China's position on the issue of unilateral sanctions is consistent and clear. We always oppose the imposition of unilateral sanctions on others by any certain country in accordance with its domestic law. There have been a series of positive changes in the situation on the Korean Peninsula at the moment, which is the result of the concerted efforts made by all relevant parties, thus worth cherishing and preserving all the more. All parties should speak and act in a way that is conducive to carrying on the current positive momentum, make greater diplomatic efforts to follow the dual-track approach, namely advancing the denuclearization and establishing the peace regime of the Korean Peninsula in a synchronized manner, with a view to realizing the lasting peace and stability there. Q: The informal meeting between Chinese President Xi Jinping and Indian Prime Minister Modi in Wuhan was the first one held in such a format between the two leaders. How do you comment on the outcomes and the significance of this meeting? A: President Xi Jinping and Prime Minister Modi held an informal meeting in Wuhan from April 27 to 28. The two leaders had sincere and candid discussions in a lighthearted and cordial atmosphere. They had a thorough exchange of views and reached important consensus on the international landscape, China-India relations and bilateral cooperation in various fields. The two leaders further clarified the trend of the times and the historic positioning of China and India, identified the important guiding principles for the development of China-India relations, and drew a grand blueprint for the China-India comprehensive cooperation. The two leaders also instructed relevant departments on the two sides to come up with specific working plans and follow-up steps. This informal meeting, which took place in an innovative format, was of great significance. Featuring in-depth exchanges covering a wide array of subjects, the meeting was based on the current circumstances while bearing in mind the future development. It deepened the friendship and mutual trust between the two leaders and created a new model for China-India leadership exchanges, writing a new chapter for China-India relations and exerting positive influence on regional and global stability and development. China would like to work with India to step up implementation of the important consensus reached between the two leaders and take this meeting as an opportunity to open up new prospects for the mutually beneficial cooperation between the two sides. Q: China released yesterday the information of Premier Li Keqiang going to attend the 7th China-Japan-ROK leaders' meeting and his visit to Japan. Do you have more details? A: The China-Japan-ROK cooperation makes up an important part of East Asian cooperation. Since its inception 19 years ago, the China-Japan-ROK cooperation has formed an all-dimensional cooperation system with the leaders' meeting at its core and underpinned by 21 ministerial meetings and over 70 consultations at working level, and a Secretariat has also been established. The three countries have witnessed fruitful outcomes of exchange and cooperation in such fields as trade, economy, finance, transportation, culture, education, environment, public health and disaster management. We have also signed the China-Japan-ROK Investment Agreement and held 13 rounds of Free Trade Agreement negotiations. The total trade between the three countries registered around $670 billion in 2017 and over 28 million people traveled in between the three countries. The 7th China-Japan-ROK leaders' meeting will be held on the morning of May 9. Premier Li Keqiang, Prime Minister Shinzo Abe and President Moon Jae-in will attend that meeting, jointly meet with the press, and address the opening ceremony of the China-Japan-ROK business summit. Next year will mark the 20th anniversary of the China-Japan-ROK cooperation. We are convinced that this leaders' meeting will open up a new ground for the China-Japan-ROK cooperation and make new contributions to regional peace, stability, development and prosperity. This year marks the 40th anniversary of the signing of the Treaty of Peace and Friendship between China and Japan, presenting important opportunities for the improvement and development of China-Japan relations. With the concerted efforts of the two sides, China-Japan relations now take on a momentum of improvement. Premier Li Keqiang's visit makes the first official one by a Chinese premier within the latest 8 years. During the visit, he will have a talk with Prime Minister Shinzo Abe, meet with Emperor Akihito and engage with people from political parties and all walks of life. We believe it will further consolidate the momentum of improvement for China-Japan relations, help bilateral relations return to the track of normal development and chart the course for our bilateral relations in the future. Q: Officials from Cheong Wa Dae said today that it's necessary to consider whether China should be a party to "the proclamation on the termination of war" in the future. What's your comment? A: China firmly upholds the peace and stability of the Korean Peninsula and maintains that the temporary armistice mechanism should be replaced by a permanent peace regime on the Peninsula. We hope that all relevant parties should work together for this goal through dialogue and negotiation. China will continue to play its role in advancing the establishment of the Peninsula peace regime. Q: On April 30, Israeli Prime Minister Benjamin Netanyahu presented documents that purportedly prove Iran had been secretly developing nuclear weapons. There are comments that as May 12, the date by which US President Trump is due to decide whether the US should quit the nuclear deal with Iran, draws near, this move by the Israeli side will cast a darker shadow on the prospect of the nuclear deal. What is your comment? A: We have noted relevant reports as well as responses made by the relevant parties. The Joint Comprehensive Plan of Action (JCPOA) was agreed by Iran and the five permanent members of the UN Security Council plus Germany (the P5+1) which was endorsed by the UN Security Council to ensure the peace nature of the Iranian nuclear programme. The International Atomic Energy Agency (IAEA) is the only international organization that has the authority to monitor and verify Iran's compliance with the JCPOA and reach a conclusion on the nature of the Iranian nuclear programme. We have noted that the IAEA has verified Iran's full compliance with the JCPOA obligations for ten times. The JCPOA put in place the strictest monitoring and verification measures on the Iranian nuclear programme. What is imperative is for all relevant parties to bear in mind the general and long-term picture and continue to earnestly implement and safeguard the JCPOA. Q: In recent years, many Chinese enterprises have engaged in property development projects in Colombo, Sri Lanka. Some of those high-rise buildings are criticized for so-called negligence of local environment and conditions. Does China have any response to or comment on that? A: As I understand, these projects you mentioned are entirely commercial cooperation projects between companies, so are you asking about the Chinese government's comment on a specific commercial project? I believe the issues arising in the process of commercial cooperation should be resolved through friendly negotiation by those relevant business partners. Q: Indian media reported that the two leaders of China and India discussed the boundary issue. In addition, the two sides are working actively to establish a hot-line between the top military commanders of the two countries. Can you confirm and comment on these reports? A: During the informal meeting in Wuhan, the two leaders exchanged views and reached important consensus on the international situation, China-India relations, and other macro-level topics, which sets out important guiding principles for the development of China-India relations and points out a direction for the handling and settlement of border issues. The two sides agreed to focus on the long-term picture, position the border issues at an appropriate place in the framework of bilateral ties, engage in communications and dialogues to explore a settlement acceptable to all, and properly manage the issues and prevent them from worsening until a settlement is reached. The two militaries will enhance confidence building measures and border defense exchanges and cooperation, which will contribute to increasing mutual trust, managing the relevant issues in a more mature and wise way, and maintaining peace and tranquility in the border areas.